Its my kit from Kim Hargreaves, so now I have to finish up Matilda Jane so that I can get started, I also have to steal the needle out of my poor shawl that has been languishing for the longest time. I had a fabulously relaxing weekend and spent time with some great people and gorgeous dogs. I did buy a few things so more tomorrow with pictures…..
that is a gorgeous kit! i can’t wait to see it knitted up. 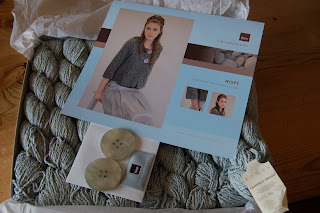 Oh, Yvette, what a gorgeous kit — beautiful sweater! I’ve always loved Kim’s designs and would love to have a kit one day, too. Oh, it looks lovely! Hope you had fun in Glasgow (it was Glasgow wasn’t it?) – can’t wait to see what you bought. i love that kit too.. so gorgous, but it looks like an awful lot of seed stitch…. come on show us what you bought! When can I graduate to knitting things like that? I Knitted (with a capital K) for two hours solid at the School Council meeting tonight. Anne-Marie is another potential knitting bee member! When do we get to see MJ finished with the skirt & jacket? Oh, I was just going to say that Jacqueline also loves Kim Hargreaves, but I see that she’s commented. I’m definitely going to have to check out Kim’s kits once my stash diet is over and done. And, really, you ought to find Jacqueline a Scottish boy — she deserves one! The kit is Wispy and it is a huge amount of Double Moss Stitch, which is not my very favourite but I do like how it looks, so I reckon it will be worth it. Jacqueline I did try and find you a man, they are kinda hard to post too though! I had great fun in Glasgow, so good to meet up with other knitters and see some yarns in real life, makes internet buying easier! MJ is needing a little tlc, blocking and sewing hems, also not a favourite but I have some new movies to watch so maybe at the weekend.